It has a huge viewing window. That is because if it didn't, I would be opening it and messing with it all the time so I could SEE what was going on inside~! We cut away the dome part of the lid which turned out to be perfectly sized to the picture frame we got. I cut the back out of the picture frame with an exacto knife and there you have it. 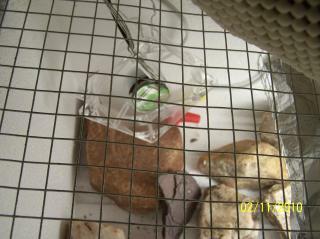 [FONT=comic sans ms,sand][FONT=comic sans ms,sand]Underneath the egg tray I have placed rocks to stabilize the temp. There is a small bowl of water on one side and the computer fan is suspended on the other side. It is just twisty tied to the hardware cloth and hangs there. The light is in the middle and I have it in a cage of hardware cloth for safety There is a folded piece of tin foil loosely draped over the light's cage to keep the heat above more even. It is actually cooler in the middle than on the sides, so that is working, maybe too well. [FONT=comic sans ms,sand][FONT=comic sans ms,sand] On top, I have placed some soft drawer liner so the fuzzy butts have something soft to land on. It keeps the glare down, too. Hopefully it isn't altering the temps. We have 2 digital thermometers in there. 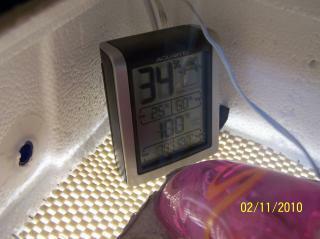 They read differently, but I am fairly certain that it is just the uneven temps in different parts of the incubator. I also have the water wiggler with a meat thermometer in the center. Hubby calibrated that for me so it reads correctly. I guess that has to be done once in a while. I stole the egg turner idea. I have a piece of large wooden dowel (or pvc) glued to the egg carton so that it leans one way. I can simply roll it to turn the eggs thereby shortening the time I have to have the bator open. [FONT=comic sans ms,sand][FONT=comic sans ms,sand] I do have tiny vent holes all around the outside of the ice chest, but the real vent hole is on top. I can just slide the picture frame side to side to create a smaller or larger space for air to get in. [FONT=comic sans ms,sand][SIZE=4][COLOR=#006600][FONT=comic sans ms,sand][SIZE=4][COLOR=#006600][FONT=comic sans ms,sand][SIZE=4][COLOR=#006600] Will update when we get the eggs in there. [FONT=comic sans ms,sand][SIZE=4][COLOR=#006600][FONT=comic sans ms,sand][SIZE=4][COLOR=#006600][FONT=comic sans ms,sand][SIZE=4][COLOR=#006600]The vent in the top was not working. It was allowing one side of the bator to be cooler than the other, so we closed the top and drilled 2 holes in the bottom section that we can easily plug with wine bottle corks. After the first week and finding it difficult to keep the humidity up to 30%, I started to suspect that my hygrometer was reading low. So on that hunch, I kept humidity between 20 and 25%. 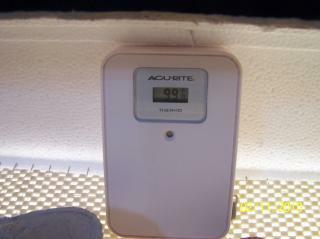 In the third week, we calibrated the hygrometer and found it to be reading a whopping 10% off!! So 20-25% was really 30-35%. Glad we did that. So for lockdown we will keep humidity between 50 and 55% per my hygrometer which will actually be 60-65%. Clear as mud? Directions for calibrating your hygrometer can be found by using your Google search line. [LEFT][FONT=comic sans ms,sand][SIZE=4][COLOR=#006600][CENTER][B][SIZE=6][COLOR=#0000ff]Disaster #2, #3, and #4 [/COLOR][/SIZE][/B] So, this morning, I found myself dreaming about the hatch. 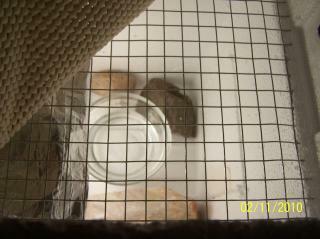 I dreamed that we were heading in to put the eggs in lock down and found that 3 chicks had already hatched! They just kept hatching and hatching and we didn't have a brooder ready. It was chaos!! Little did I know that what I was having was a vision of what was to come! They didn't hatch, but the chaos!! I tried not to panic. I dripped wax on it as best I could, but I decided that I better get them into lock down and up the humidity before that little egg dried out and died. Well, as soon as I put extra water in there, the humidity shot up to like 85% and the temperature dropped to 97*. I was freaking out! I quickly made some minor adjustments and tried to be patient - knowing that it was the big changes that I made in a panic that caused this. Little changes, and wait, adjust, wait. I have removed the eggs from the cartons and laid them on their sides so the little chickies can get all positioned to hatch. I didn't have to do this. 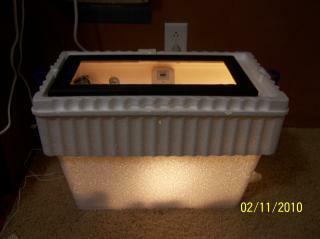 I am assured they will hatch in the cartons, but I didn't want to do it that way. 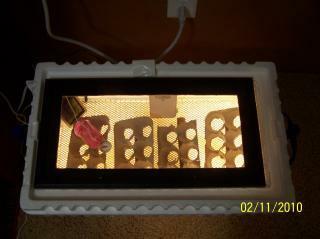 The 5 eggs to the right are clear, but I left them in to stabilize temperatures on that side. It tends to be a little cooler over there. Here are the 15 that were alive and kicking at the time of Lockdown. The one I smashed is in there. I am so hoping I didn't kill that little chicken. Most are Wheaten Ameraucana or Wheaten/Blue Wheaten Ameraucana. There are 2 EEs (easter eggers). The brown egg is from a Delaware x W/BW Ameraucana, and the smallest egg is "Steve" (a referrence to the squirrel in Over the Hedge), a Polish x W/BW Ameraucana. We are so excited about that one!! We hope Steve makes it!! Come on little chicks!! Hatch! [IMG][URL]https://www.backyardchickens.com/forum/uploads/19636_100_9830.jpg[/URL][/IMG]Unabsorbed yolk. This chick died 2 days later.